One afternoon I crouched by a small piece of shallow open water on an otherwise frozen lake trying to get some decent photos of green winged teal. Just as the ducks went bottoms up to forage for food a muskrat appeared from the bank. 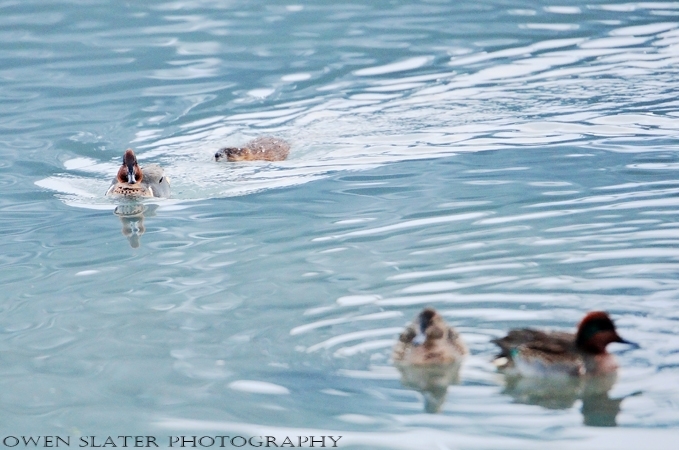 It immediately spotted the teals and to my surprise, swam directly towards them. The unsuspecting birds continued to dabble away at the bottom of the lake as the muskrat quickly closed the gap. Just as it was about to reach one of them, the ducks spotted him and in a burst of energy they frantically splashed and paddled away. Not to be discouraged, the muskrat picked up his pace and gained ground (or water) on them. Like a wolf separating off the weakest animal, the muskrat honed in on the slowest one. With less than a foot between them, the muskrat went into stealth mode. It dove under the water and in a burst of speed went for the underside of the duck. I’m not sure if it was successful at biting the duck or not, but the duck flew up into the air and the muskrat surfaced in its wake. Before the teal could land, the muskrat turned its attention to the others and another chase ensued. After several close calls with the other teals the muskrat took a break. It dove down, grabbed a plant and headed back to its lodge. Seeing that the muskrat was gone the ducks resumed feeding. After no more than a few minutes the muskrat returned. This time the ducks were prepared. Seeking refuge from the marauding muskrat, some of the teals jumped out of the water and rested along the frozen shoreline. As they preened themselves the muskrat chased after the remaining teals still in the water. They quickly decided to join the others along the shoreline, which seemed to placate the muskrat. It found some more food and returned to its lodge. Some of the teals sat down on the ice while the others kept a lookout. They were soon on high alert again as the muskrat made its way back to the feeding area. With its head above water the muskrat must have spotted the ducks. It swam back and forth directly in front of them but the ducks stood their ground. That is until the muskrat launched itself out of the water and literally started running after the teals on the frozen lake! 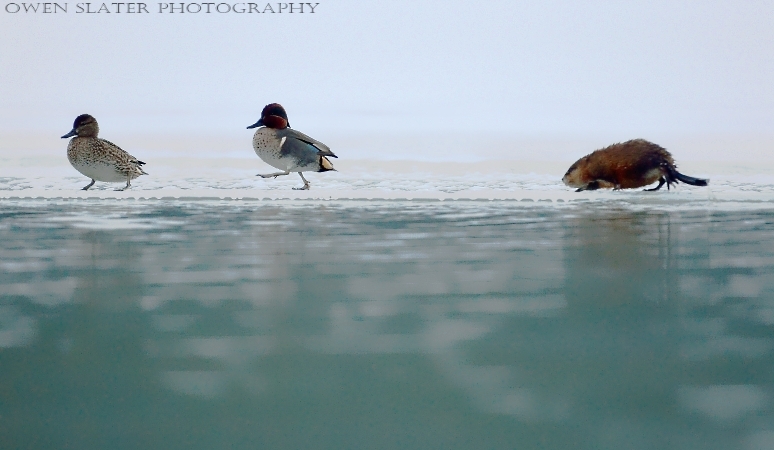 After a bit of frantic waddling the teals took flight and landed back in the open water. This only resulted in a brief reprieve. The muskrat dove back into the lake and resumed the cat and mouse chase. This cycle continued off and on for over an hour. By then the teals must have had enough and flew off, no doubt in search of a muskrat free patch of open water! I made my way back to my car, chuckling to myself along the way. Just before I was out of sight, I turned for one last look and there was the muskrat eating a plant in the middle of the water with no teals to be seen! That must have been fun to watch and land a great photo. Hi Lyle, it was great entertainment though the teals and muskrat likely didn’t think so! You enough material for a YouTube movie. Great pictures. Sometimes I wish I could take both photos and video at the same time! What a funny story! Lovely pictures, too.